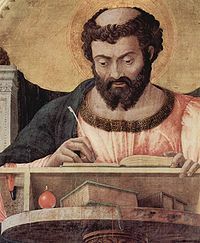 St. Luke writing his Gospel, by Andrea Mantegna (1431). Luke the Evangelist (Greek: Λουκᾶς, Loukas; Hebrew: לוקא, Lūqāʻ; Aramaic: ܠܘܩܐ, Lūqāʻ) was early Christian leader and the writer of the Gospel of Luke during the 50's AD. He was of Greek origin and a native of Antioch. He was a companion of the apostle Paul and is also known as “the beloved physician” or “doctor” as mentioned in Colossians 4:14 . Smith’s Revised Bible Dictionary, 1999. This page was last modified on 30 November 2010, at 19:03.